Dr. Robert H. Rediker was born in Brooklyn, New York on June 7, 1924. In 1941 he entered M.I.T. but left the Institute in 1943 for three years service in the U.S. Army. After the war he returned to M.I.T. and received the B.S. degree in electrical engineering in 1947 and the Ph.D. degree in Physics in 1950. From 1950 to 1951, Dr. Rediker was a research associate at M.I.T. 's main campus. When M.I.T. 's Lincoln Laboratory was formed in 1951, he was among the first to be appointed to the research staff there and worked on transistorized computer circuits. After spending the academic year 1952-1953 in the Physics Department at Indiana University, he returned to Lincoln Laboratory and engaged in semiconductor device research. From 1959 to 1966 he headed the Applied Solid-State Physics Group at Lincoln Laboratory, and in July 1966 he was appointed to the faculty rank of Professor of Electrical Engineering at M.I.T. Dr. Rediker's continuing and central research interest has been in the design, development and understanding of semiconductor devices useful in the broad field of electronics. Among devices developed and investigated by Dr. Rediker and his co-workers at Lincoln Laboratory are semiconductor lasers and radiation-emitting semiconductor diodes. He has published over 50 professional articles, is a Fellow of both the IEEE and the American Physical Society as well as a member of Sigma Xi. He has been active both on professional committees of the IEEE and governmental advisory committees. Dr. Rediker was a member of the IEEE Technical Committee on Solid State Devices from 1956 to 1966 and was chairman from 1961 to 1963. From 1962 to 1968, he was a member of the administrative committee of the IEEE Electron Devices Group, was secretary-treasurer 1964-1965 and vice chairman 1965-1966. He was a member of the committee that conducts the annual Solid State Devices Research Conference from 1960 to 1968 during which time he was technical program chairman in 1963, vice chairman in 1964 and chairman in 1965. He has served on a working committee of the Advisory Group on Electron Devices and has since 1966 been a member of the Special Group on Optical Masers of the Department of Defense. 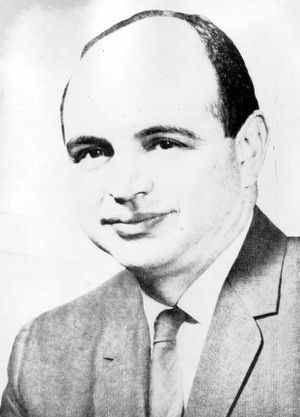 In addition, he served as vice chairman of the program committee for the Northeast Electronics Research and Engineering Meeting (NEREM) in 1968. Dr. Rediker and his wife, the former Jane Friend of New York City, lived with their two sons Richard, and Donald, in Newton Lower Falls, Massachusetts. Both he and his wife had a long-time interest in local community affairs; he was now vice-chairman of the Newton Lower Falls Improvement Association and his wife has served on the board of the local League of Woman Voters for the past five years, the last two as first vice-president. Dr. Rediker enjoys playing bridge and endeavors to play "at" tennis at least once a week during the warm months in New England. This page was last edited on 18 January 2019, at 16:03.